What is Total Gym® TV? Total Gym TV is an on-demand video platform to stream Total Gym® workouts from any device 24/7. Total Gym® TV is available to everyone - no matter where purchased or which model. If you own a Total Gym® you can stream workouts online with Total Gym TV. How Does Total Gym® TV Work? Does Total Gym® TV Cost Anything? Total Gym TV offers the Total Gym fitness community two great on-demand streaming options. Total Gym TV Basic gives FREE online streaming access to the Classic Library of 16 Total Gym Workout Programs, previously available only on DVD. Join Total Gym TV Basic today for free. Pay nothing – ever. For those looking for more variety and new workout content, Total Gym TV Premium is a monthly subscription-based option providing UNLIMITED access to both the Classic Library of 16 Total Gym Workouts PLUS an All-Access Pass to new premium workout programs the moment they launch - streamed online from any device. Premium Members will discover new trainers, new workouts and all the best programming Total Gym TV has to offer with 3+ new workout programs added each month – totaling nearly 50 new Total Gym Premium Workout releases planned annually. If I sign up for a Basic Membership, can I upgrade to Premium later? YES! You can upgrade to Premium at any time in your online member dashboard. How do I cancel my Total Gym® TV Premium subscription? Subscriptions can be cancelled easily at any time through the self-serve online member dashboard. 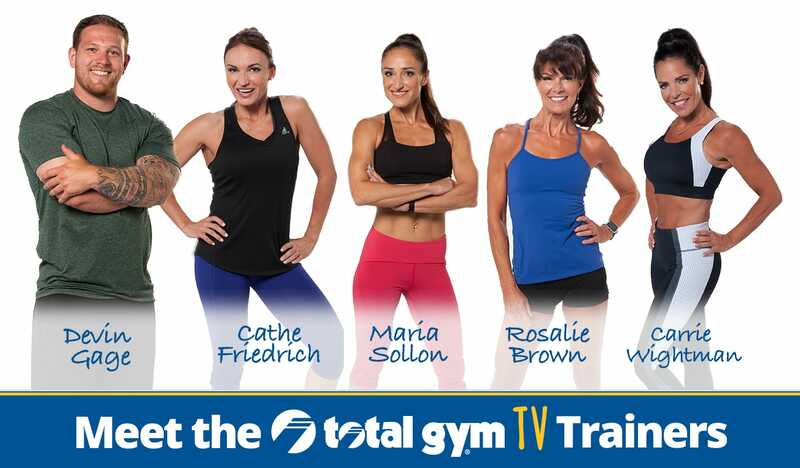 Click Here to Learn more about Total Gym® TV. These Total Gym TV Trainers are featured in our Premium Workouts, which are released monthly. Each trainer creates a variety of workouts that range in length from quick 10-minute blasts to full-length 45-minute programs, for diverse exercise choices. Learn about each trainer below! Cathe Friedrich is a fitness professional and leading innovator in the home exercise video industry. For over thirty years, Cathe has built a following by providing fun, flexible and motivating ways to exercise and stay fit! Today her fitness empire, which includes over 400 DVDs and live stream workouts, is one of the largest privately-owned fitness video libraries in the world. Cathe’s dedication and strong influence on the fitness industry led to her induction into the Fitness Hall of Fame in 2011. Cathe’s motto has always been, "if it doesn’t challenge you, it doesn’t change you!"